Technics SH-MZ1200 - "overall opinion of the technics sh mz1200"
Rane MP2014 - "An awesome sound and manufacturing quality for a new approach to mixing"
Korg KM-402 - "Versatile and easy to pickup 4 channel mixer"
Tascam X-9 - "Before its time, but now behind times. EQs!!" Rane TTM 56 - "Wow"
Pioneer DJM-500 - "Very good mixer!" 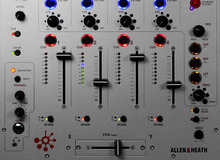 Behringer NOX303 - "Mixer and a interface"
Allen & Heath Xone:92 - "Xone 92 was the best in this range"
Behringer DX2000USB - "This has it all"
Pioneer DJM-700-K - "Used it with vinyl and CDJ platters"